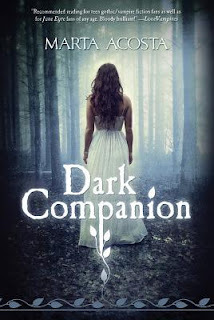 Today I have Marta Acosta, author of Dark Companion, on the blog! TCR: How would you describe your book in ten words or less? MA: A young adult modern gothic and homage to Jane Eyre. MA: I can't remember! I think I was hesitant. I am cover obsessed and always trying to imagine how readers will perceive the cover. I asked that the font be changed and Tor Teen was kind enough to do that. The image online is lovely, but the actual book cover has more depth and detail. I love it. TCR: What has surprised you about the publishing process thus far? MA: Publishing sits very painfully atop a concertina wire fence between commerce and art. The people at the parent corporations who control the business are not a good mesh with those at the editorial level who love literature more than profits. MA: If I was organized, you could go to my website, www.martaacosta.com, but I'm more frequently found at my daily blog, www.vampirewire.blogspot.com, and on Twitter, https://twitter.com/#!/MartaAcosta. Tirzah, thanks so much for having me here at TCR! Read on to see what Dark Companion is about! "Orphaned at the age of six, Jane Williams has grown up in a series of foster homes, learning to survive in the shadows of life. Through hard work and determination, she manages to win a scholarship to the exclusive Birch Grove Academy. There, for the first time, Jane finds herself accepted by a group of friends. She even starts tutoring the headmistress’s gorgeous son, Lucien. Things seem too good to be true. The more she learns about Birch Grove’s recent past, the more Jane comes to suspect that there is something sinister going on. Why did the wife of a popular teacher kill herself? What happened to the former scholarship student, whose place Jane took? Why does Lucien’s brother, Jack, seem to dislike her so much? As Jane begins to piece together the answers to the puzzle, she must find out why she was brought to Birch Grove—and what she would risk to stay there…." This one will be on sale July 3rd, 2012! Stay tuned for my review! I'm so excited to read Dark Companion! And the cover is gorgeous! Thank you for the interview. DARK COMPANION looks amazing. Cover Talk: New Sarah Dessen Covers!